RUMUR | How Frames Blind Us. This morning, Vox published an article about Dr Sarno that I was quoted in. I was so disturbed and frustrated by the title, “America’s most famous back pain doctor said pain is in your head. Thousands think he’s right,.” that I did not post the article to our Facebook page. Instead, I wrote to the author requesting that they re-visit this title. Here is what I wrote to the author in order to clarify why the title is problematic. The subject was “great article”. I have one small suggestion, which is that you reconsider the title. I don’t believe that Doctor Sarno ever said, or even insinuated, that the pain was all in anyone’s head. Instead he said that the process was initiated in the brain. The problem is that so many people take that to mean that the pain is not to be believed or or that it is not real. This allows them to dismiss the idea out of hand without any real consideration. This can be very misleading and problematic. All of the press materials for the film “Unrest” use this term to describe what the director was told when she came down with chronic fatigue*. For her this sparked anger and rage that made it impossible for her to even consider that mind-body factors might be at play and the whole movie is structured around resistance to this idea. The fact is, it is almost impossible to believe that anyone said it, but it is what she heard. This is what your readers now hear as well. Even “this famous doctor believed that pain begins in your brain instead of your back” would be much closer and less “inflammatory”. I realize you likely didn’t write the title, but hope you can address it. It paints him as being out of touch and uncaring rather than cognizant of something most others could not see. This weekend I wrote this, “If Stress is the Real Problem, Ignoring It is Dangerous” about auto-immune issues. I just got back a note letting me know that the author and editors “don’t agree with my interpretation” and that they think it is “fine to leave”. I believe it sets up an argument that distorts what Dr. Sarno was really saying, and therefore increases resistance to the ideas. The last third of the article points out that much of what Dr. Sarno argued is being borne out by science. Unfortunately, the first two thirds are very critical – which will make most people very skeptical. The article itself is by Vox’s science writer, Julia Belluz. She wrote this piece after many people, including myself, reached out to her in regards to her previous article on mind body approaches to back pain ignored Dr. Sarno. It is interesting that she ignored Dr. Sarno because the article is largely based on Cathryn Ramin’s book “Crooked: Outwitting the Back Industry and Getting On The Road To Recovery”. That book does have a full chapter on Dr. Sarno. However, while this article does cover him and his work, I believe the framing of it falls prey to the same problem that most scientists have with his work: it confines his ideas to a very narrow frame of science that tends to dismiss their import because some of the details aren’t exact. About two-thirds of the way through the article the author quotes Ramin. The problem with this idea is that it is stuck in a biophysical mindset rather than a bio-psycho-social one. The inference is that because Dr. Sarno looked at this pain through the small round lenses of Dr. Freud, his theories were therefore ignoring the fact that there might be physical/neurological changes in the brain causing physical pain in the body. This framing presupposes that the idea that we can then focus on dealing with the neurological issues directly and by extension dismiss the idea that emotional factors (or the way in which we frame and engage with the world) might be the cause of the neurological changes that appear on the MRI. Dr. Sarno’s framing doesn’t argue that those changes don’t exist, but instead that those markers on an MRI – just as disc herniation or other physical markers on an MRI – don’t necessarily mean that the cause is neurological. Instead, seeing these neurological changes might be evidence of a possible emotional cause. In other words, the approach described, when stuck in a biophysical approach, will more likely lead to a search for a drug therapy to re-set the “diseased” brain process rather than an emotional approach. Hence his lack of interest in that data. Even as this Vox article comes to discuss the rising focus on a bio-psycho-social approach to the problem, it is still stuck in that biophysical frame. Focusing on the fact that Dr Sarno did not do randomized control trials, the article allows “more credible” scientists to dismiss his work without calling into question the flaws in their logic. “It is not really credible to claim that you can cure 75 percent or more of patients with chronic low back pain, especially since no one has been able to duplicate these kinds of results or even close to it, as far as I’m aware,” said Roger Chou, a back pain expert and professor at Oregon Health and Science University. Belluz follows with, “For example, we now have MRI studies showing that people with chronic pain have different areas of their brain light up when they are exposed to painful stimuli.” However, as mentioned before, this actually supports Dr. Sarno’s ideas rather than negates them. It shows us that chronic pain has less to do with a response to outside stimulus like a cut or a bruise and instead those areas of the brain that process emotions like fear. The figure of 75% that Chou mentions wasn’t pulled out of thin air but instead comes from a study in which Dr David Schechter, when he was a student at NYU medical center, spent a summer calling former patients of Dr Sarno randomly to find out how they were fairing months and years after treatment. He was so shocked by the positive results that he took it upon himself to follow Dr. Sarno’s precepts in his own work and in 2007 had a follow up study done on his own work. I believe that this is a severe oversimplification of a “metaphorical” or bio-psycho-social approach to the problem. Everyone has their own path, their own story (hence my term metaphorical), that creates the frame from within which they see the world. On one level, that might refer to how we view our pain. However, it also shapes how we might process information or ideas. A doctor who takes a bio-psycho-social approach might ask “what’s going on in your life?” before asking “what activity were you performing when your back went out?” For that doctor, knowing that your wife just kicked you out is more important than hearing that you were loading boxes into your car (because your wife just kicked you out). If the pain comes from a compound fracture of someone’s femur that occurred while skiing, it is very different from someone bending over to tie their shoe and finding themselves unable to stand back up – one has a clear physical initiation for the pain and the other one doesn’t add up. Being interested in what is going on psycho-socially expands the range of possibility rather than limiting it. This does not mean it is a “one size fits all approach.” It’s really the biophysical approach that is the oversimplified and/or limited. This framing cuts out the psycho-social aspects without even considering them. This is often done by pointing to the fact that there is no science to back up the psycho-social aspects. However, the science story behind “standard care” can often be very flimsy. The reason Dr. Sarno came to his mind body theory was that what he had been taught to do – bed rest, hot packs, traction, etc – didn’t seem to be helping his patients. So he looked at the data on these biophysical approaches and found that there essentially wasn’t any. It was just what people did. In fact, even when there is “scientific evidence” for an approach to pain, it is often overturned in subsequent years. Fat was bad and now it is good; it was the cause of heart disease- or was that sugar- or is it a combination of both? This article even states that Dr. Sarno was right about ditching the use of bedrest as a way to help patients in pain. The way in which we practice science is framed from a story telling approach. We ask a question in order to get an answer. Often times we ask those questions like a five year old might in order to get a clean yes or no answer. We create false vacuums so that we can isolate for factors in order to find a result that we can work with. Unfortunately, things are often more complicated. We used this clip from Dr. Gabor Maté in a post we mentioned above, but I will re-use it here because it proves a certain point. Women who came in for a breast biopsy due to a lump were asked a series of questions about their lives. They were asked about their stress levels as well as their sense of isolation in the world. Taken alone those two questions didn’t mark a significant difference. However, if the patient indicated that they were both stressed and isolated they were 9 times more likely to have a malignancy. The bio-psycho-social approach doesn’t lend itself to randomized control trials, or its cousin: drug treatments. Further, the science actually is clear about back pain. There is no doubt that it is exacerbated by stress. Unfortunately, the question that isn’t even considered by mainstream medicine is “is it possible that this stress could be the cause of many people’s back pain?” Dr. Furlan bristles at this suggestion, citing a lack of evidence. However, the real question is, has anyone asked? 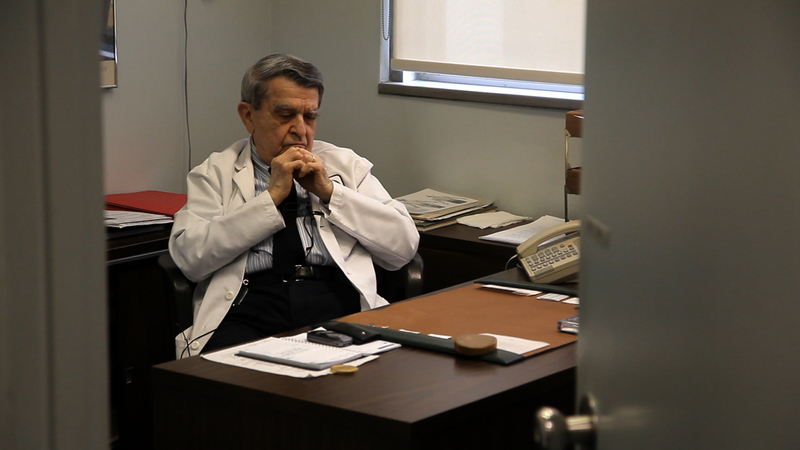 Beloved by his patients, Sarno was also derided by his medical peers. He didn’t have much of an influence on medical research during his lifetime. Tellingly, his NYU colleagues never referred their patients to him. Over the past year the film has racked up 97 reviews on IMDb. All but one of those reviews is either 9 or 10 star (there’s a 1 star review that argues the real problem is vitamin D). However, the reviews by critics have been quite critical. It would not be a stretch to say that they are even directly shaming of me in particular for using the film to tell my personal story. This is quite ironic because the film is largely about how our culture shames us for expressing emotions- and that this is hazardous to our health. We have also had a great deal of trouble getting the film seen, or written about, so it is having very little influence on the field. Tellingly, it is our only film to receive negative reviews, but once again it is beloved by the people who are open to the ideas. * The following is how the film is described on their website. “Jennifer Brea is about to marry the love of her life when she’s struck down by a fever that leaves her bedridden. When doctors tell her “it’s all in her head,” she turns her camera on herself and her community as she looks for answers and fights for a cure.” – The quotes are theirs which clarify this is exactly what she was told.